Headbones is a temple-tickling way to hear music that works by sending vibrations through your head, courtesy of British audio firm Damson. Your ears stay empty with Headbones headphones, with the audio tech instead making use of 'incisor diffusion technology' to ship noise to your noggin. This basically means that Headbones delivers the tuneage by conducting audio through your temporal bone, i.e. the bits at the sides and base of your skull that support your temples - Google uses the exact same tech on its Glass smart specs. The tech utilises the naturally occurring acoustics of the human skull to maximise audio enjoyment, sidestepping the risk of hearing-damage that standard in-ear/over-ear headphones pose. The fact that your lugs stay wide open while listening to music is the main USP of headbones. Joggers, for instance, can listen to 'Eye of the Tiger' guilt-free because hazards like approaching vehicles are easy to hear. But wait, what if youwantto block out the world? Headphones are great escape from the perpetual disquiet of modern life, so Headbones has included ear-buds too for those early morning tube trips when it's just you and your favourite Himalayan pipe music LP. 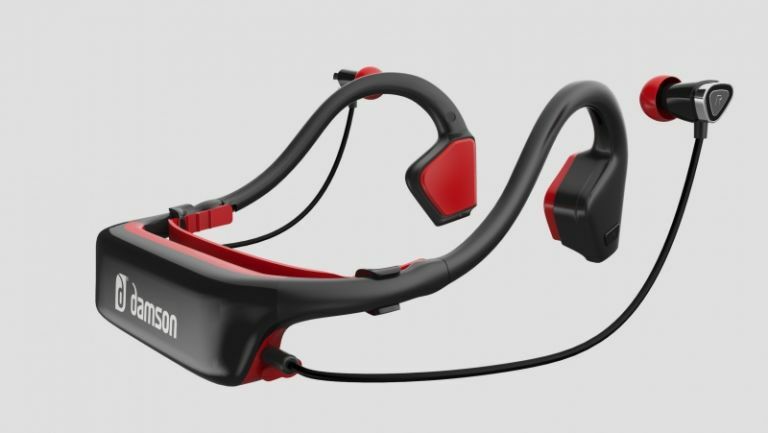 At the time of writing, the Damson's Headbones Kickstarter project has £75,000 funding with eight days left, meaning the safety-first audio gear has breezed past its target of £50K. “Kickstarter has proven a successful platform for launching products before they hit retail stores,” says James Talbot, Damson Founder and CEO. If you fund the project, you can get your very own pair of Headbones for £50, half-price on the £100 r.r.p set for launch.